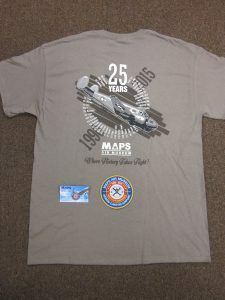 MAPS Air Museum will be celebrating our 25th Anniversary on June 20, 2015. We have created three items to commemorate this event; a 25th anniversary t-shirt, pin and patch. We have created a package on our online storeroom that includes all three for $21 plus shipping. If you would like to link to the website to make the purchase, please click on the picture. Thank you for your support for the past 25 years.